Choosing to build a custom or semi-custom yacht is a carefully made decision that comes from knowing what you like and do not like in a vessel. The initial stage in the construction process involves reflection on the type of yacht that will best meet your needs. It’s important to evaluate the purpose for which you would like the vessel, such as for business, for personal / family cruising, or for charter. Other important questions include where you would like to cruise, what you would like its performance level to be, and the amount of interior space you desire. We will advise you, over a series of meetings, on the type of yacht that encompasses all the features and amenities you are looking for. We will help you organize and prioritize your ideas so that the design you move forward with includes all your must-have features. If you do not have a specific designer in mind, we will apply our industry resources to connect you with expert designers who can your further develop your vision. We will arrange meetings for you to discuss your ideas. Once you’ve selected a designer, your SYS Broker will coordinate the necessary legal paperwork. We will be present to advise you throughout this design stage and ensure the project moves forward in line with your requirements. After the design has been finalized, the selection process continues with choosing the right shipyard. We are knowledgeable on the many shipyards available and can evaluate their ability to meet your expectations regarding design elements, delivery schedule, and budget requirements. If necessary, we can also find subcontractors to work alongside the designer and shipyard. Once you’ve decided on a builder, your SYS broker along with your legal counsel will begin negotiations to ensure you reach an agreement regarding important points such as build times, specifications, warranties and payment. Every element of the build process will be agreed upon before signing with the shipyard. We will facilitate this process until an agreement is reached and construction is ready to commence. Once the contract is signed and a project manager is brought in to liaise the build process, construction will begin. Your SYS broker will coordinate with the PM from the very beginning to the very end to make sure your best interests are upheld. We will facilitate progress with the build team, project manager, surveyor, and any other party involved. 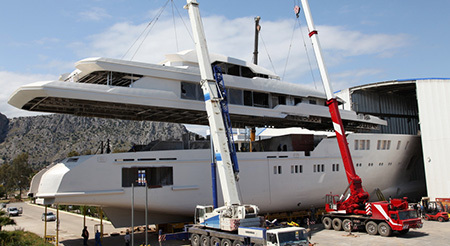 We will also ensure that the yacht’s construction is executed according to the terms of the contract. We will update you as often and in as much detail as you see fit. Once construction is completed, your SYS broker will confirm that all your yacht’s specifications have been met according to the contact terms. From there, the most exciting phase commences: testing the vessel. We will manage this final stage through supervising the tests and sea trials ensuring that they are handled properly and professionally. Once your vessel is deemed ready for use, we will make sure you have a smooth delivery. We will coordinate all the formalities involved in the acquisition process. 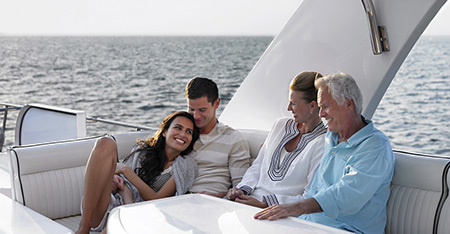 Our service to you continues long after taking delivery of your yacht. We can assist in every aspect of yacht management, including shipyard support, registration, documentation, insurance, training, and crew selection. Should you wish to charter your yacht, we have a talented marketing team to ensure your vessel receives global exposure to luxury charter clientele.